prizes of their own choosing. This is a special Double Contest which is created to help new players take a part in it, and towards others who want to win prizes. More expirianced players are free to join both contests if they feel like it, but I will mostly reward only newer ones. 2nd Contest: Make a card which you would like to play whit, anything is allowed but it has to be balanced and around Rare or lower it's power level. The post was edited 3 times, last by AvalonRoxy ( Jun 10th 2018, 11:41am ). Exactly what do you mean with "in card form". Should the card give it being an constant/action/construct or should it be on a troop which has this improved version of the keyword in question? I changed it so its much more simpler then before. "Avenge - This gets +1 and Swiftstrike"
"Avenge - This gets Rage 2." There could even be cards that trigger Avenge abilities without something needing something to die (like Dream's End). Avenge would be easy to flavor in Ruby or Blood, but card I want to showcase shows how diamond might utilize the Avenge mechanic. Avenge - Another target troop you control gets Lifebound. "I've lost one friend to the enders. I will not lose another." Ward is a keyword when gained or during deckbuilding you choose a shard and that card can't be targeted or dealt damage by cards of the chosen shard.This would also change the keyword to be RUBYWARD SAPPHIRE WARD ETC and wouldn't be changeable during reserves. This would likely be limited to oneshots or end of turn effects for low rarity cards and higher rarity cards as a permanent effect. I am going on a small vacation and will be back June 20, so I can only judge then. I am hoping this won't inconvenience anybody but I am also raising the rewards to 15 000 gold as form of an apology. 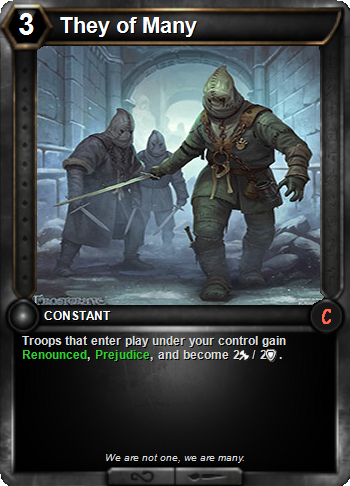 Prejudice - This card deals double damage to troops which does it does not share a trait with. Renounced - This card loses all shards, traits, and non-keyword text. The post was edited 1 time, last by HaughtyHeretic ( Jun 11th 2018, 12:16pm ). Hello to all, sry for the the wait. I actually took over 10 minutes to chose which card I like the best but over 30 min to chose 2nd place. was hard for me to judge as it had two new keywords which was unfair as it made it much more customized. The prejudice keyword was great as just like the Arcanyx one it made sense but on the other hand it was quite on the weaker side and not really imaginative. But the reason why it took me so long was the 2nd keyword. Renounce. That keyword could be fun used on enemy troops as there are no [DISPEL] type of keywords in the game and that is something which I would love to see more off in this game - non removal / removals. Then we had Isengard's card which had WARD keyword. The part where you can socket it made it very apealing as sockets are one of big advantages HEX has over similar games. I was hard for me to place you on third place , I rly love the design of it, but it's the least unique one of them all besides the socket part, so I had to give it to Heretic. Even thou it was only 3 cards I love all three very much i would very much love to see more ideas from you guys if event dosn't die off complitly. I am sad to see that such a fun event is dying off. I was gonna spam in chat each day for ppl to enter but kinda busy month plus that trip at the end. Glendower is my man, so I'll take the Artificer's Mallet. (IGN matches forum name) Thanks for running the contest. I for one would two-ly a-three-ciate if you could head over four an awesome contest. The post was edited 1 time, last by Arcanyx ( Jun 20th 2018, 5:15pm ). I'll take that. Been a fun contest design. Ok by tommorow everybody should recive all of their rewards. All rewards have been sent. Sorry for such low tier rewards. The point of these events are not to get brides of the damned... the points of these events are to share creativity and reward people for having fun with you. Don't feel bad, regardless of what prizes you may have had to offer.